According to Ethnologue: 2,037,929 in Democratic Republic of the Congo (2000 WCD). 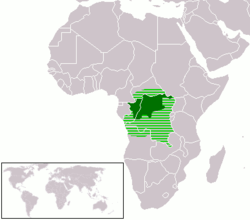 Second-language speakers together with Bangala in Democratic Republic of the Congo: 7,000,000 (1999 WA). ... 90,553 in Congo (2000 WCD)... Population total all countries: 2,139,202. According to Omniglot, literacy in Lingala is very low. This Latin-based orthography uses two extended characters (open-e and open-o). The orthography marked with tone (diacritics) is strongly recommended by the CELTA, it is used in some dictionnaries. Apparently the recent Mandombe script has been adapted for Lingala. It is not clear to what extent it may actually be used, however. Tokosepelaka míngi na botángi o kásá malúli ma báníngá baíké, bakosɛ́ngɛ te báléndisa bolakisi kóta ya Pútú o kelási ya baíndo. Yangó malámu míngi sɔ̂lɔ́. Kási bandeko ba bísó bâná bakobósanaka te malúli ma pámba pámba makomɔ́nisa moto lokóla mwána mokɛ́. Mwána sɔ́kɔ́ azalí na límpa sikáwa, ekomɔ́nɔ yě sukáli, akobwáka límpa pé akolela sukáli. Loléngé lɔ́kɔ́ sɔ́kɔ́ bakolakisa bísó lingála, kiswahíli, kikɔ́ngɔ́, tsiluba, b.n.b., toébi naíno malámu tɛ́, tokoíbwáka pé tokolela français, flamand, anglais. Wâná níni? Tokomɛmya kóta ya bísó tɛ́; tokoíbébisa bobébisi. Na yangó mindɛ́lɛ́ bakolomɔ́na bǒ bána bakɛ̂ ba bilúlélá pé bakosɛkɛ bísó. Even though most Unicode fonts have the necessary characters, only a very few have the proper OpenType? table definitions to places accents on base glyphs? correctly, especially for the open e and the open o. Most fonts will simply misplace the acute, circumflex or caron accents ahead, behind or in case of captital, right in the character. Même si la majorité des polices de caractères Unicode contiennent les caractères lingala, très peu les affichent correctment. La plupart ne place pas les caractères diacritiques sur le e ouvert, le o ouvert, ou les majuscules. AfRomanSerif? - Afromanserif Regular, Bold, BoldItalic, Italic, and AfSans Regular and Bold; both with correct diacritics placement. "Premiers mots, premiers propos en lingala" http://perso.wanadoo.fr/pascal.grouselle/index.htm . Site with information and links. The Liboke ya Congo project and then Éveil du Congo have localized AbiWord. Le projet Liboke ya Congo et ensuite Éveil du Congo ont localisé Abiword. There are some translated strings on Ubuntu's Rosetta. Quelques chaînes ont été traduitent sur Rosetta.